Looking for a bike that is light and nimble? 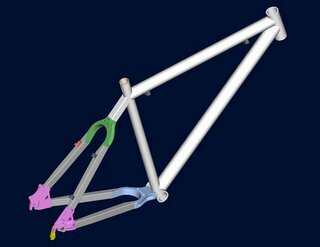 Customers have told me that this frame rides like a steel bike with the weight of an aluminum bike - sweet! Here is a screen capture of the 2006 APEX aluminum hardtail - the frame is made from Easton 7005 Ultralite tubing and the rear triangle has custom CNC machined dropouts and yokes. Cabe routing is disc-specific.